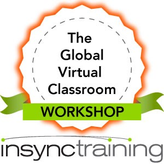 What is a Global Virtual Classroom? It's a strange new world we train in. It is not uncommon for us to facilitate sessions to participants from three or more countries. Differences in native language, culture, and even time zones can change the dynamic of the class, and even impact your messaging. Am I using local idioms that don't translate across cultures? Is it morning for me while evening for participants in Australia? Am I the only native English speaker? Any of these characteristics can change the dynamics of a classroom; combine them and we need to pay extra attention. And remember, all of this is occurring in the virtual classroom, without the benefit of eye contact and body language to help us keep track of how participants are doing. Focus on these four key design concepts and you will be on your way to creating your own effective global virtual classroom. Recognize the influence culture plays in the classroom. Culture is a 'shared pattern of preferred values, beliefs, attitudes, assumptions, and behaviors that define the way of life for an individual.' Defining a way of life is a BIG DEAL- and while we may not understand, or even support, a particular philosophy, we need to be inclusive in our instruction in order to engage our audience. The multicultural classroom blends participants from various cultures to form a diverse learning environment. Identify course and materials design considerations for working with global audiences. First, identify who may potentially be in your audience and learn about the different cultures/nationalities/countries. Case studies and anecdotes should be reviewed so they are relevant to everyone (Tip: use reviewers from the different cultures to provide this feedback). Some materials may need to be translated. Consider exercises that encourage your cross-cultural audience to collaborate in a way that creates trust and not conflict. Adjust your existing instructional design and facilitation skills to accommodate a global audience. Consider incorporating more reflective exercises and less lecture, so language is less of a barrier. Use a producer to capture key thoughts that are spoken aloud and type them into chat, to ensure understanding. Moderate your pace, and encourage participants to bring their own experiences to the classroom. And work with local contacts to help you understand local concerns. Identify challenges regarding technical issues, class dynamics, communication challenges and cultural differences when working with global audiences. Different cultures have different expectations about participation requirements and their relationship with facilitators. When you combine that with the fact that they are bringing their own expectations and paradigms to class, understanding is key. And remember, not everyone has the same comfort level with the virtual classroom. An extra bonus - learning to teach in a global environment helps you to become a more informed global contributor. This is the future of work, and you may just be ahead of the curve. Interested in designing for the global virtual classroom? Check out our new course, The Global Virtual Classroom Workshop, by clicking on the graphic below.